Better shots = Win More? Not always right away. Every year about this time lots of junior players have just finished a summer of training, either locally or often overseas, most often in China. (We had eight juniors from Maryland Table Tennis Center training in China this summer.) They all now have better shots, some devastatingly so. I watched a couple of them after they returned, and got this deep-down tingling of fear - I have to face that on the table soon! It can be pretty disappointing for a player to do all that training, develop these better shots, and seem to have nothing to show for it! But the good news is that this is temporary. They just need match experience, and soon they will become the terrors that their shots already are. This applies not just to juniors but to all players who train and improve. It's like an archer who is handed a high-powered rifle for the first time. He has a much better weapon, but he probably needs to learn how to use the thing first. When he does, watch out! Here's a video (9:44) of Richard McAfee teaching what I call the scooping method of serving heavy backspin. Most players try to serve backspin by stroking down, when they should be stroking up. Don't believe it? See the video. And note that the contact point is toward the front of the ball as the racket goes under the ball. Here's a general rule: beginning players mostly contact the ball above the ball's equator. Intermediate players mostly contact the ball around the ball's equator. Advanced players mostly contact the ball well below the ball's equator, near the south pole. Are you a south pole server? Yes, here's Richard again, teaching an ITTF Coaching Seminar at the Lily Yip Table Tennis Center in New Jersey (31:14). Because I like to do things in threes. Because I like to do things in threes. Because I like to do things in threes. Yep, it's time to start thinking about attending the USA Nationals, Dec. 13-17 in Virginia Beach, VA. Will you be there? The other huge upcoming USA tournament is the North American Teams, Nov. 25-27 in Baltimore, MD. Both of these tournaments will have in the range of 700-800 players. It so happens that for the first time probably ever, both tournaments are on the east coast, and in fact just a three-hour drive apart. So this is a rare "two-for" opportunity for many on the east coast - we can all become road warriors and drive to these tournaments, along with the many others held on the east coast. Of course, there are plenty of tournaments in other regions as well, including some big ones. I have no idea how to play on these tables. After 35 years of playing and over 30 years of coaching, I'm stumped. Do you keep a table tennis notebook? I did for years, and I recommend you do as well. I used a steno notebook. From front to back, I would take notes on my own play - what I was working on, what drills I was doing, what worked and didn't work in matches, etc. On the other side - back to front - I kept tactical notes on opponents. When the side on me was filled up (it usually went first), I'd simply flip it over, and it would be a permanent record of my notes on opponents, and I'd get a new notebook and start fresh. At tournaments, I'd bring past notebooks (with the ever-growing notes on opponents), and would be ready against any opponent I'd ever played against. Years later I started transcribing my tactical notes onto my computer, and then all my notes, including the ones on my game. And then, after doing this for perhaps a decade, I realized that I'd been doing it so long that all the notes were in my head, and that I no longer needed to write things down to remember them. So I retired my notebook. Even now, when I see an opponent from long ago, I usually can remember my tactical notes against him. However, while I no longer have a notebook for my game, I still keep a notebook for players I coach. When I show up at, say, the USA National Cadet Trials, I have about a page of notes on each of the major contenders, which I regularly update. Yesterday was the first time I played in three or four weeks. During that time I've had others do my hitting when I coached. But after getting the okay from the sports therapist last week, I did 2.5 hours on Sunday. It was mostly multiball, but that had hurt my back before. Now the back seems almost back to normal - there were no problems during the 2.5 hours. I'm going to continue with light play for perhaps another week or so, and gradually work myself back to regular play. The two things that most hurt the back - forehand looping and forehand pendulum serves - didn't seem to bother it yesterday, but I only did a few to test it out. The real test is if I can do these things repetitively. In layman's terms, here's roughly what had been the problem with my back. The muscles on the right had grown so tight over they years they had shortened dramatically. As near as I can understand it, they attach to the backbone underneath, and so had pulled the base of the spine out of alignment, so the spine was now pointed off to my left. When the doctor and therapist first saw it, they both wondered how I could even stand up with my spine twisted like that! After a month of doing a ten-minute stretching routine three times a day, and meeting twice a week with the therapist (where she put it through far more), the spine has straightened out. Soon my loops will once again terrorize opponents who don't instead sneer at it and counterloop. USATT Historian Tim Boggan has done writeups on the latest five members of the USATT Hall of Fame: Amy Feng, Azmy Ibrahim, Brian Masters, Mitch Seidenfeld, Bill Walk. Congrats to all! "We already have 42 millimetre balls in a test series and are waiting for the results." "And of course, the increase of the net up to one centimetre is always a topic." They just ran the $45,000 (!!!) Los Angeles Open this past weekend, and here's the web page, but I can't find any results there. Am I missing something? The web page is packed with great info, but is missing the most important info of all after the tournament - the results! I could piece together most of the results from postings on various table tennis forums (Wang Zeng defeated Zhou Xin in the final, 4-1, etc. ), but it sure would be helpful to have the results posted publicly on their web page. Could you imagine, say, a similar tennis tournament where the results were not posted? Here are the results of the New York City Open held this past weekend. (Make sure to set it to New York City Open in the field at the top, and note that you can then look at all results of any event by selecting that events in the second field.) As you may know, it was schedule for the previous weekend, but it got Irened. So they rescheduled for one week later, and still got 167 entries, down about a hundred. They didn't run the Open - many of the top players were now at the LA Open, and of course when you lose 100 players because of a hurricane, you probably can't afford to run the Open. Here's a nice exhibition point by China's Wang Liqin and Ma Lin (1:06) - enjoy! This article, now online at Butterflyonline.com, was originally a Tip of the Week from back in February, but I added some stuff from Coach Jack Huang (one of my co-coaches at MDTTC), and sent it in to Butterfly, who published it yesterday. (You even get to see a picture of me and my "devastating" forehand!) A related article is How to Move Up a Level, which explains the five things you need to do to improve a level, with #5 about finding that overpowering strength and ways to use it. Back update - I'm back! Yesterday I got the okay from my physical therapist to resume table tennis activities as long as I go easy on it. I can finally hit with my students! For the last couple weeks I've had others come in to do my hitting. Originally I was going to take six weeks off, but the therapist thought three weeks would be enough, and now, after two weeks, after examining my back, said I'm ready. It's been a busy two weeks; I've been doing a ten-minute stretching and strengthening routine three times a day, and meeting with the therapist twice a week for a more rigorous routine. For now, I'll just do easy stuff - multiball, blocking and easy countering, and perhaps I'll do a few easy loops just to test it out. Surprisingly, the back rotation from my forehand pendulum serve (along with looping) put the most strain on my back; I'll test that out. Playing games also put a lot of strain as I wouldn't know where the next ball was going and often did last-second moves that strained the back - and this was even more true even when playing beginners, since they spray the ball randomly all over. So you want to be a better table tennis coach? PATT (that's Principles Approach to Table Tennis) tells you how with their article, How To Become a Better Table Tennis Coach. They also sell two books on table tennis, "PATT - A Principles Approach to Table Tennis" and "PATT Notes - Volume I," both written by USATT National Coach Donn Olsen. These are rather theoretical books that try to develop the basic principles of table tennis and apply them as "a foundation for exceptional play" (the subtitle of the first book). Here's video, pictures, and discussion of World Men's Doubles Champion Xu Xin illegal hidden serve, which, like other world-class players with such serves, is rarely if ever called. The fact that he's a lefty only makes it easier to hide the serve. I'm linking to this one because this is the one someone chose to use as an example; they could just as easily have used most other world-class players, since most at least sometimes hide their serves. Here's an incredible counterlooping point between Wang Hao and Ma Long (1:05). When looping from the wide forehand it's especially natural to loop with sidespin as you drop the wrist and hook the ball back to the table, with the ball curving to the left (if looped by a right-hander). When looping from the backhand corner with the forehand you might use less, as you are now contacting the ball on the near side - and now, in fact, may sidespin the other way, so the ball jumps away to the right (if looped by a right-hander). This latter type of sidespin is generally more difficult. You should generally loop either with whatever sidespin is most natural (without forcing it), or intentionally use sidespin to mess up the opponent (which is why many top players learn to sidespin either way, usually so that the ball breaks away from the opponent). Here's a nice video from PingSkills (3:08) on looping with sidespin. And now a little history. 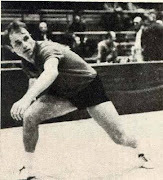 At the most extreme end of the sidespin spectrum might have been Istvan Jonyer of Hungary, the 1975 World Men's Singles Champion. He often looped with almost pure sidespin, dropping his racket tip down so as to contact the ball of the far side of the ball and hooking it onto the table. It was his ability to loop around the net, so the ball would often just roll on the table, that caused the ITTF to add the rule that the net must extend six inches past the table. Otherwise, players like Jonyer could take nearly any ball on their forehand side and go around the net. Here's a short video (0:22) of Jonyer against Chinese star Xie Saike at the 1981 World Champions. The quality isn't good, but in the first four seconds you get to see Jonyer serve and loop two forehands, with the second one a vintage sidespin loop from the wide forehand. And while we're at it, here's a nice 31-second clip of Jonyer against soon-to-be World Champion Guo Yuehua of China in 1979, with Jonyer looping and smashing over and over while Guo (usually an all-out attacker) lobs. Read what ITTF President Adham Sharara said in an interview that went up yesterday. The article said, "With regards to the size, Adam Sharara said that the new ball size would be increased. This is to give a chance to defensive players to overcome offensive players. If the ball is bigger, rallies will become slower so defensive players will have more chances to win points." Uh oh. Regarding the upcoming ban on celluloid balls, he said, "The current plan of the ITTF is to prohibit the use of celluloid ball. Such move is because of two reasons. One is that celluloids are toxic and it will have an impact towards the factory workers. The second is that it is quite dangerous to transport since it highly flammable. The new ball will be seamless and China already counts with two factories that are working in the new ball, one owned by DHS, and the by Double Fish. It will be operational as soon as the London Olympics is over." He also said, "I need to cut the legs off the Chinese players!" He was joking here. But he wasn't joking about the ball size. Prepare for bowling ball table tennis. SmartPong has 24 videos on the various strokes and techniques. I just added them to our video library. Here's an article on the ITTF page about the ITTF Coaching Seminar being run by Richard McAfee in New Jersey, which includes mention of their battles with Hurricane Irene. Go to INDUCKS, the worldwide database of Disney cartoons, and in the Keywords/title field put in either "table tennis," "ping pong," or "ping-pong," and watch as zillions of Disney cartoons featuring table tennis come up! Enjoy. Someone emailed me the following question (this is just an excerpt): "I can't generate heavy spin just average spin.... Any tips that may help me." Since this is a common problem, I thought I should put my response up here. You might need to work with a coach directly to find out why you are having trouble creating spin on your serves. However, here are some possible reasons. Grazing motion: are you really grazing the ball at contact? If so, there should be little speed on the ball as most of your serving energy should convert to spin. If your "spin" serves are going long, and with good speed, then you probably aren't grazing the ball much. Racket speed: a lot of players slow down their service motion so as to better graze the ball. This defeats purpose of grazing the ball. Serving is a violent motion - if you want the ball to spin at 100mph, you need your racket tip to move 100mph. That mean's using body, arm, and (most important) wrist on the serve. Wrist motion - a common problem is not really snapping the wrist into the ball, leading to low racket speed. First, you should be changing your grip for most serves to maximize the wrist motion. (If you aren't sure how to do that, any coach or top player can show you.) then snap the wrist into the serve like a whip! Check out the simple serves used in this clip of 2-time U.S. Men's Champion Marty Reisman versus 5-time World Men's Champion Viktor Barna (1:50) in 1949, or between Reisman and Bobby Gusikoff (26 sec) circa 1960. Compare these to modern serves, such as Men's Singles World Champion Zhang Jike of China versus Jun Mizutani of Japan (13:05) - quite a contrast. Now check out the serve of Japanese star Keiko Okazaki! This German doesn't just play basketball for the Dallas Mavericks; he's got some nice forehand technique! Well, pretty good for a basketball player anyway. Who would win in a matchup of these teenage heartthrob singers? Here a picture of Justin Bieber playing table tennis, and here are three of Greyson Chance: photo1 photo2 photo3. But now we have the video! Here's Justin on the Ellen DeGeneres Show (where they compete serving balls into a bowl, starting 55 seconds in), and here's Greyson playing at a party (short clip starts at 1:28 in). Time for them to drop all this singing silliness and focus on the Olympic Sport of Table Tennis! Yes, a man ate his ping-pong paddle. But it was hardbat, so it was okay. What are your table tennis goals? And before you say them, remember this. There are two voices that will constantly ridicule your goals if they are too high. One is from some other players, who may not have the same lofty goals for you that you may have for yourself. Ignore them, and go for your goals. (Though it is helpful to have reasonable goals - just don't limit yourself.) The other is that little voice inside your head that says, "You can't!" Ignore that voice. In the words of Albert Einstein, "Great spirits have always encountered violent opposition from mediocre minds." So drop the mediocre voice from your mind and let the great spirit soar. Dear umpires, coaches, and players, let's go over this one more time. Rule 2.6.6: "It is the responsibility of the player to serve so that the umpire or the assistant umpire can be satisfied that he or she complies with the requirements of the Laws." Read that over once or ten times, and it'll still say the same thing. If you aren't sure if the server is hiding contact with his serve, then you aren't sure he isn't, and the server is not serving "...so that the umpire or the assistant umpire can be satisfied that he or she complies with the requirements of the Laws." You can give a warning the first time, but thereafter you must call a fault. If you do not, you are not umpiring; you are allowing one player to cheat, and making sure more players will do so since they see umpires are not enforcing the rules. You know, the rules, the ones umpires are supposed to enforce? Do we really want a sport where cheaters prosper and those who do not cheat are chumps who can't compete because of the umpires? As a coach, I often feel like a chump at tournaments since I haven't taught illegal hidden serves to my players, while more and more opponents are using them. It's pretty much rampant at the higher levels. To those who say it's okay to go to the limit of hidden serves as long as you don't actually hide them - if you do that, then sometimes you will inadvertently go over the line and actually hide them. That's the nature of going to the limit on something. More importantly, if you go to the limit, the umpire from his vantage point can't tell for sure if the serve is hidden or not, and therefore he is legally obligated to call the serve illegal. See the rule quoted above. So you cannot go "to the limit" on hidden serves. If you can't serve so the umpire can see that contact was clearly visible, it's an illegal serve. Yes, this is a picky subject for me because I don't teach illegal hidden serves at my club, and neither do the other coaches there. But other coaches from other clubs do, and we have to face these players and their illegal serves in tournaments. Since we don't teach illegal hidden serves, our players do not have illegal hidden serves, and since we also haven't taught their practice partners to do illegal hidden serves, they are not experienced at returning illegal hidden serves, and so often lose to those who use illegal hidden serves because the umpires are allowing opponents to use illegal hidden serves. You'll find a number of interviews of top players and coaches and other table tennis items at Matt Hetherington's blog. (He's based in New Zealand, but seems to know everyone.) For those of you who just can't get enough table tennis. That means you. And you. And yes, you too. ...here's my article Ten-Point Plan to Tournament Success! And here's a link to the USA Table Tennis Tournament Schedule. Suggested equipment for beginning and intermediate players. Here's a great video (8:21) of Olympian and five-time U.S. Men's Singles Champion Sean O'Neill teaching the forehand. Note the emphasis on being in balance - left and right sides, backswing and follow through, etc. Here's a slow-motion video (1:10) of world #2 Timo Boll of Germany doing a reverse pendulum serve, and following it up with two forehand loops. Two things of interest. First, note how long he spends at a complete stop before the serve - he's visualizing the serve before doing it, as you should always do. Second, about 38 seconds in, as he prepares for his first forehand loop, see how he changes his grip into a forehand grip. Most players do not change grip during a rally; Boll does. I sometimes think this might be the next technique revolution, where players change their grip for certain shots as part of the stroke. Right now it is frowned on by most coaches, just as receiving short serves to the forehand (against backhand serve sidespin) with the backhand was a few years ago, or reverse penhold backhands. Yes, techniques change. So you were all set to compete in the New York City Open this past weekend? And then that mean old blowbag Irene showed up and postponed the tournament? (I'll post here when/if it is rescheduled.) Well, fear not - below are other upcoming tournaments (through October) in the Northeast region! This includes the four-star Westchester Open, Oct. 8-9, also in New York, as well as the three-star New England Open, Sept. 10-11. I've also added four-star tournaments from outside the region - the LA Open, Badger Open (in nearby Wisconsin), and Berkeley Open. Oh, you're not in the northeast region? Then see the USATT tournament schedule for your region. I had a little fun on Saturday. All day long, roughly every hour, I put up a new note regarding the approaching (and arriving) Hurricane Irene. Here they are, gathered together for the first time, for your reading enjoyment. Lots of first-round defaults here at the New York City Table Tennis Open. Where is everyone? But someone told me the top seed in women's singles, Irene, is on her way. It's an undark and unstormy Saturday morning. Can we keep it that way? I know you're pretty angry right now because I called you a fat airhead. But please calm down. What happens in North Carolina stays in North Carolina, but only if you stay in North Carolina. I hear you are still on your way, and that you're taking your anger out on innocent people. Look, I'm sorry I called you a fat airhead, but c'mon, let's be honest, you're 500 miles of swirling hot air. I'm sorry I called you Raunchier Irene, but Raunchier *is* an anagram of Hurricane. It won't happen again. Please remember the restraining order. Can't we just use Skype? Could you pick up a gallon of milk and a dozen eggs on your way? Can't we talk this over? I promise to put the seat down next time. Call me. If you stop now, I won't sick FEMA on you. I'm warning you - I have an umbrella and I know how to use it! There's a crazy woman pounding on my door! Come quickly! You want a description? Um, a swirling mass of air about 500 miles wide, and, well, here's a picture I took with my cell phone. Get away from my house! And what do you mean you're going to leave "a nicer ruin here"? Yes, I know that's an anagram for "Hurricane Irene," but come on! We have to stop meeting like this. The neighbors will talk. HELP!!! Irene's using an axe on my front door! She's coming after me! And - she keeps saying, "Heeeeeere's Irene!" This is an all-points bulletin for Irene, wanted for loitering, vandalism, creating a public disturbance, water boarding, and the murder of SF writer and table tennis coach Larry Hodges. Suspect is 500 miles wide, made of wind and water, and was last seen traveling up the U.S. east coast at thirteen miles per hour. Suspect is armed and dangerous; shoot on sight. Off to New York City Open! EDIT - BREAKING NEWS AT 10:30 AM - Due to Hurricane Irene, the New York City Open has been postponed. Hopefully Hurricane Irene won't interfere. At the top right of the North American Table Tennis home page there's a status update, which currently says, "The NYC Open is still scheduled for August 27 and 28. If weather conditions require us to change the status of the tournament we will notify you here on our website and on our facebook page." I saw the physical therapist again yesterday. She's working on back muscles I didn't know I had until they started hurting! My daily routine has been upped from five to ten minute back stretching sessions, three times a day, in addition to meeting with the therapist twice a week. If all goes well, I'll be back to playing in three weeks. Because of my back problems, yesterday I did a coaching session at the home of one of my 10-year-old students, using his brand new Newgy 2050 robot to do the hitting. The catch was they hadn't set it up yet, so I was there for two hours, spending much of the time setting it up and figuring out how to do the various programmed drills (there are 64 pre-programmed drills), how to reprogram them, etc. It went pretty well, though there's a lot still to learn about its capabilities. We got it doing various popular drills, including one to forehand, one to backhand, and the Falkenberg drill (three-shot sequence: backhand from backhand corner; forehand from backhand corner; forehand from forehand corner). Here's a very nice video (4:02) on the backhand loop by TTEdge. ...in a LONG time! He played in the Lily Yip Table Tennis Center Open, Aug. 20-21, and went 5-0, 15-0 in games! I believe he won the Open event - can anyone verify? His rating going in was 2447 (he didn't gain any - best win was Lim Ming Chui, 2094), but that was from the Paleolithic period, circa (I'm guessing) early 1980s or so. Scott is also playing in the New York City Open this weekend (Open, Over 40, Over 50 - how time has passed), so I look forward to seeing him there. I think the ideal situation is for USA Table Tennis to create a model of a U.S. league that states and regions can use. This is not a matter of USATT imposing its model on others; it's about having such a model so those interested in creating leagues will have a model to start with. This is how it was done in table tennis and other sports all over the world. At the 2009 USATT Strategic Meeting, I argued strongly that USATT should meet with German, English, and others from the hugely successful European table tennis leagues at the Worlds, to find out how they had created their leagues. Germany has over 700,000 members of their league competing in 11,000 clubs; England over 500,000. It's not a matter of their setting up leagues for a large membership, as some USATT officials believed; the leagues are what create the large memberships. The key is how they created and grew these leagues, not their current status - though that's what we are working toward. Since we already send numerous officials to the Worlds, meeting with these league officials wouldn't have cost anything. Then we could take this info, study other successful leagues in other sports, and then get successful table tennis league directors in the U.S. to meet and create a model for a USA Table Tennis League that can be used by those interested. (I suggested we put a bunch of successful league directors in a room and lock the door, and tell them they can't come out until they have designed this model.) Sadly, none of this has happened that I know of; USATT is perpetually in a cycle of things we're going to do without actually ever doing them. I look forward to the day when they break out of this cycle. (This was originally from a forum posting, but I thought I'd put it here as well.) It's extremely helpful to have a slow, spinny loop, for four reasons. First, many players have difficulty with slow, spinny loops, and if you don't have one, then you are handicapped in the match. Second, it gives you more variation, which makes your other loops more effective. Third, against a very low, heavy push, it's much easier to go for a slow, spinny loop then to try to power it all the time. And fourth, if you are missing your faster loops, it's good to have a slower and steadier loop to fall back on. There is less slow looping at the highest levels, but that's because at that point they can pretty much rip anything they see. However, even there you'll see some slow loops as variations, depending on the circumstances. But anywhere below the world-class level a slow loop is one of the more underused shots. How do you do a slow, spinny loop? One key is to let the ball drop more than usual, especially against backspin. A common mistake when slow looping is to slow the swing down. Instead, use normal power, but graze the ball so finely that most of the power converts to topspin. Then get ready for your follow-up - and note that the very slowness of your shot gives you time to prepare for the next shot. This is why when you step around your backhand corner to forehand loop many players either loop a winner or a slow loop. If you loop medium, then unless you have fast footwork you might not have time to react to the likely block to your wide forehand. I had an interesting coaching session last night. The 10-year-old kid I was coaching was having trouble on his forehand. Normally when I tried to work on it, he'd quickly lose interest and want to work on something else. Because of my recent back problems I had John Hsu (2274-rated junior and recent ITTF certified coach) doing my hitting for me while I coached. John kept commenting on how the kid needed to work on the forehand, and that seemed to get the kid's attention. I think he knew me too well, and I'd been too "soft," changing focus to other things rather than insisting on fixing his forehand problems. This time we spent the entire hour on his forehand, and he looks much better now. I've assigned lots of shadow practice for the next week, and when we meet next Wednesday (with John again doing my hitting), I hope it will have paid off. There's been a lot of talk about the upcoming ban on celluloid ping-pong balls. I blogged about this on Aug. 5, Aug. 8, and Aug. 10. If you are interested in more, here are links to ongoing discussions of it on the about.com, mytabletennis, and OOAK table tennis forums. If anyone knows where I can get any of these non-celluloid, seamless ping-pong balls to test, let me know and I'll test them and post a review. We survived the Great East Coast Quake of 2011. The Debt Limit Crisis. The Iraqi, Afghanistan, and Libyan Wars. The Glue Ban and 40mm Balls. So what to do now? Captain Jean-luc Picard has the answer. I put together a rough proposal for a professional league for our top players - see below! Feel free to steal this idea, though it'd be nice to credit me. Table Tennis Master has put together a great video (11:21) compiling the greatest points from the 2009 Worlds. Enjoy! Here's an interesting article on the growing popularity of table tennis. Here's an interesting article on football star Connor Crane and table tennis. Kevin Garnett, basketball, and table tennis. Here's a 37-second news video on basketball star Kevin Garnett in China, where he plays table tennis at the end. After putting it off all summer while we held our training camps at MDTTC, I finally saw the physical therapist yesterday. (The earthquake hit while I was in the waiting room - see below!) It turns out the stretching I've been doing for my back, mostly up and down, wasn't helping; it was side-to-side stretches that were needed. Already the back feels a lot better, and I almost feel ready to play again. For the next few weeks I'll be doing five minutes of back stretches three times a day, and meeting with the physical therapist twice a week. The good news is she thinks I might be ready to play again in three weeks. She knows how strenuous it is, and I'd obviously start by taking it easy. Meanwhile, I have others (John Olsen, John Hsu) doing my hitting for me while I coach. Plus I'll get this weekend off (my busiest coaching time) since I'll be coaching at the New York City Open. While in the waiting room yesterday for my 2PM appointment with the physical therapist (see above), the Great East Coast Earthquake of 2011 hit. The news reports had it as a 5.8, then upgraded it to 6.0, then downgraded it to 5.9, then downgraded it again back to 5.8. (If we get angry aftershocks, we know who to blame.) They evacuated the building for half an hour while they checked for obvious cracks, then invited us back in. The therapy session was only 45 minutes late. The earthquake was apparently the strongest in the region in at least a century. Over the last 48 hours, I've had car, house, dog, and Larry repairs. Here's the cost-benefit analysis. Reason: Engine was making vibrating sound and other problems, plus general checkup. Benefit: I can get to club to coach to make money, and to grocery store to buy food using this money, and so won't starve to death. Reason: The neighborhood townhouse association asked me to fix the rotting wood under the front windows of my house. Benefit: By repairing this, the townhouse association won't throw me out of my house, thereby making me homeless. Reason: My dog, Sheeba, is 13 and a half years old, and needed a tune-up. Benefit: She's still alive and begging for bacon snacks. Cost: $183/hour for initial diagnosis, $65/hour thereafter. Benefit: I might play table tennis again. I was mentioned in an article on alternate realities in Escape Pod, with my SF story Tom the Universe cited as an example of using a black hole to create an alternate universe! Also mentioned in article were my peers, Albert Einstein and Max Planck. To start up a championship league system for top U.S. players, with the goal of becoming a major league with TV, spectators, substantial salaries for players, and profits to owners. The League will most likely start up in one region, one with a substantial population base and top players. It is hoped that other regional leagues will start up separately, which would lead to playoffs and a possible “World Series” final. For the first two years of the league, to get the league off to a successful start, the League Commissioner shall have near absolute say in all matters. All rules may be changed or waived by the commissioner at any time during the first two years, but only for extenuating circumstances. This is to avoid bureaucracy. Only a 2/3 vote of the owners can overturn a decision of the Commissioner during this period. It is the goal and plan of the NTTL to have the owners take compete control of the league after two years. As the league’s finances improve, player salaries and/or bonuses will increase, as will owner profits. During the start-up phase of the league, it is hoped that owners, players, officials, spectators and volunteers will assist in all ways possible to get the league off to a successful start. Owners and players need to look at the NTTL as a long-term investment, and do whatever possible to make the league a success during the formative years. It is hoped that the league will be a financial success within the first two years. § All teams will represent a geographic area, preferably a city. § All teams will adopt a team name. § All teams may have six players on the roster for the season, although only three may play in a given meet. Changes in team rosters must be made with at least one week's notice, with approval of the commissioner. § Players must reside within 50 miles of team’s home venue. This rule is primarily to allow players to play at least half of their matches locally, and may be changed eventually or waived in certain cases. § All players on a team must wear matching uniforms, but different from the opposing team’s uniforms. It is recommended that teams contact manufacturers and distributors to get sponsors for this, with assistance from the commissioner and executive director. § The two highest rated players who compete in at least 12 of 14 team matches during the first year automatically have right to be on roster for the same team in the second year. § Each owner will designate who the team coach will be. This person may be anyone, including the owner or a player on the team's roster. § All teams will play two team matches per month. § Team matches will be scheduled on Friday nights, Saturdays or Sundays in such a way that no two team matches ever take place on the same day. In this way, the Executive Director may attend and publicize all meets. § The League would meet for six months of the year, with each team playing a league match roughly twice each month. These numbers may vary, depending on the number of teams in a league. If there are eight teams in a league, then each team would play seven home matches, seven away matches, or 14 team matches total. § All league matches will be best of 9, with 3-person teams, with each player on each team playing the 3 players on the other team. § Generally, teams would play against all other teams in the league twice, once at home, once away. § All franchises will be responsible for holding half their meets in a home playing area. § Playing area shall have one feature table, two practice tables (preferably in separate region), and adequate seating for spectators. § Venues should have concession sales available. § Upon buying a franchise, an owner has perpetual rights to that franchise for the duration of the NTTL, unless he sells these rights with 2/3 approval of other owners. New franchises can only be accepted upon approval of the commissioner in first two years, and of 2/3 of owners thereafter. The franchise fee will be decided by commissioner in first two years, by owners thereafter. § Owners will elect a president, vice president, treasurer and secretary from among themselves; however, they will mostly be an advisory function for first two years, except for the treasurer, who will maintain all financial records. All team matches will be umpired by an umpire hired by the NTTL. Local owners will pay this umpire $20/team match, but no expense money. Umpires are expected to dress in appropriate uniforms. When finances improve, officials may be paid more. o 100% of concessions go to the local owner. Concession income must be reported to NTTL. o 10% of ticket sales go to NTTL. o 10% of ticket sales go to the Championship Fund. o 25% of ticket sales go to the local owner. o 15% of the ticket sales go to the visiting owner. o 40% of ticket sales go to the 6 players in the meet. q 60% of this money goes to the winning team’s three players, divided evenly. q 40% of this money goes to the losing team’s three players, divided evenly. o All local expenses, including $20/meet fee to the match umpire, will be paid by the local owner. o Visiting teams must pay all their traveling expenses; however, local owners should assist in providing hospitality when possible. o 90% of all NTTL fees (after expenses) go to the Executive Director. o Remaining 10% goes to the Championship Fund. o The Championship Fund will be split by top four teams in the league in the following proportion: 1st 40%; 2nd 30%; 3rd 20%; 4th 10%. Players who win these funds split them evenly in proportion to how often they played. For the first two years, the volunteer Commissioner's word is final in all matters. The Commissioner will hire the Executive Director to run the league for the first two years. After two years, the owners will create bylaws, and run the league themselves via a hired Executive Director. § He shall organize and publicize each meet. § He shall work with local owners in bringing in paying spectators, media, and sponsorships. The Owners and Commissioner will work closely with him on this. § He will do whatever is necessary to turn the league into a success. This is just at the start - as league grows, there would be more money from more spectators and sponsors. If there are 8 teams, and each team plays each of the other teams twice, there will be 56 team matches. At $50/meet, there will be $2800 in the Championship Fund. This is just at the start - as league grows, there would be more money from more spectators and sponsors. o $1000 of the $3000 initial franchise fee goes to expenses and league promotion.